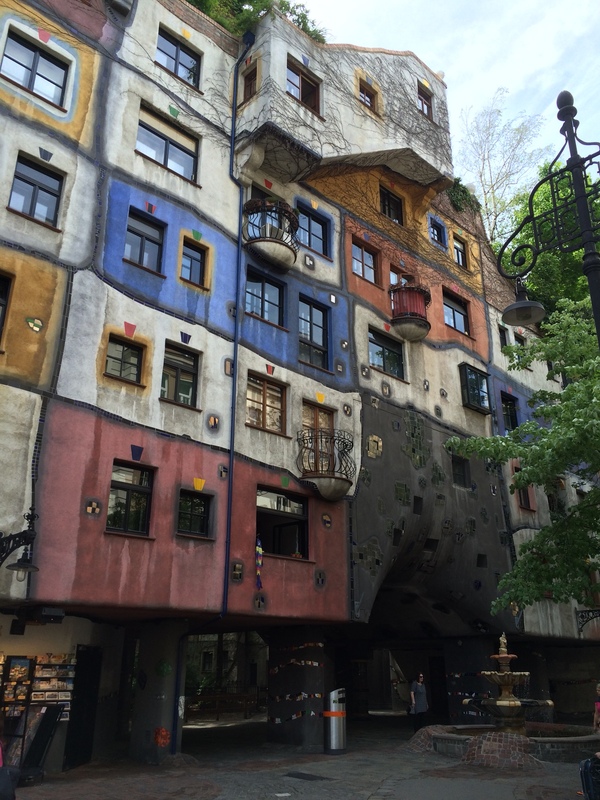 After spending a couple days just walking around the city center getting our bearings and looking at magnificent structures from the street, we finally settled on our first excursion, the Hundertwasserhaus. According to Wikipedia, the artist, Friedrich Stowasser, was born in Vienna in 1928. 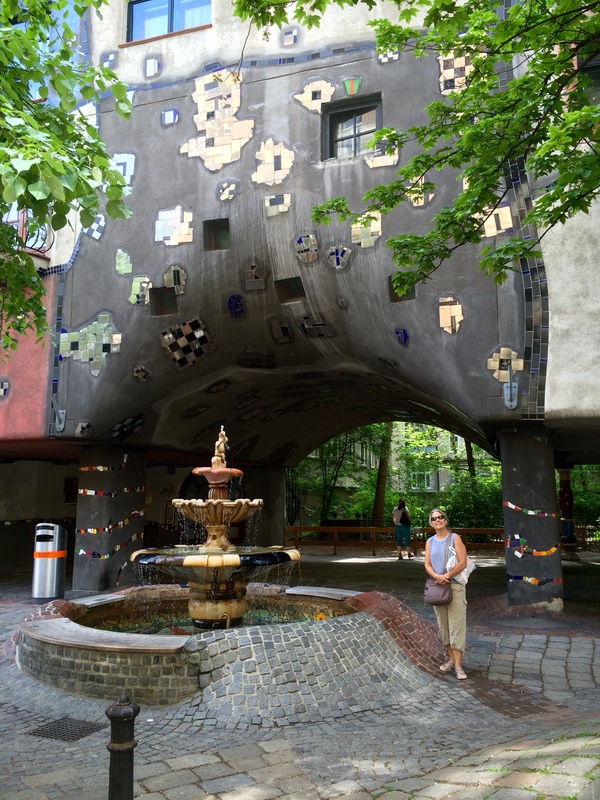 After World War 2, he studied art briefly at the Academy of Fine Arts in Vienna and began carrying a small paint set around at all times, sketching and painting and calling himself Friedensreich Regentag Dunkelbunt Hundertwasser, which translates to: Peaceful-Kingdom, Rainy-Day, Darkly-Multicolored, Hundred-Waters. Learning this made me think: “Um, okay, this guy's a little different.” But it certainly made us curious to see what he was all about. 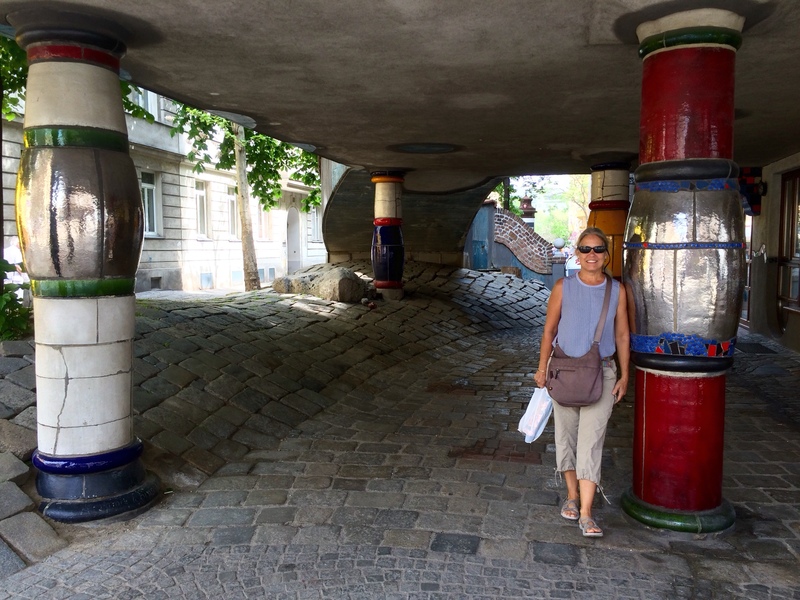 So we spent the better part of an afternoon looking at Hundertwasser's paintings and prints at the Hundertwasser gallery and museum, KunstHausWien, and found that we like his artistic style, even though we don't normally get the finer points of modern art. Hundertwasser's use of bright, vivid color and seamingly random asymetrical shapes kind of grows on you. 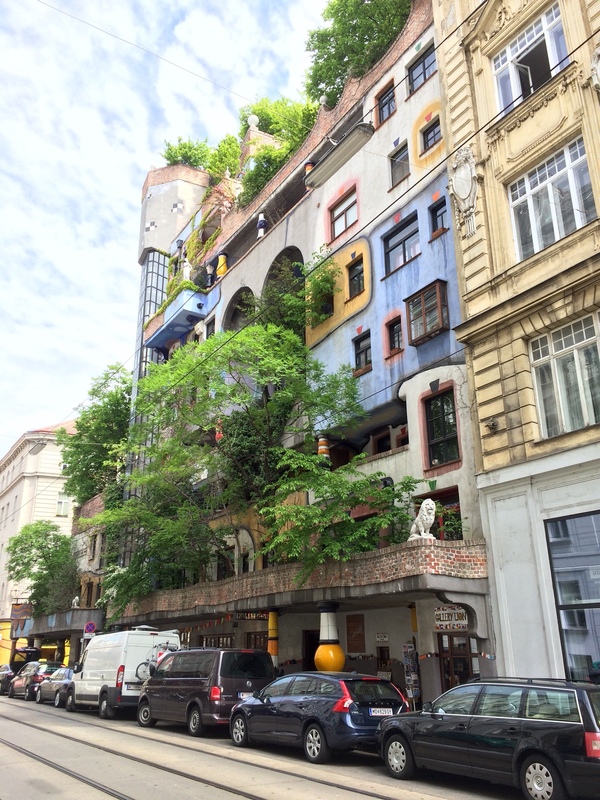 But the main thing we came to this part of Vienna to see was his living art: the Hundertwasserhaus, an apartment complex of 52 apartments, 4 offices, several communal areas and 250 trees, that he designed as an expression of his beliefs about how man should interact with the world. 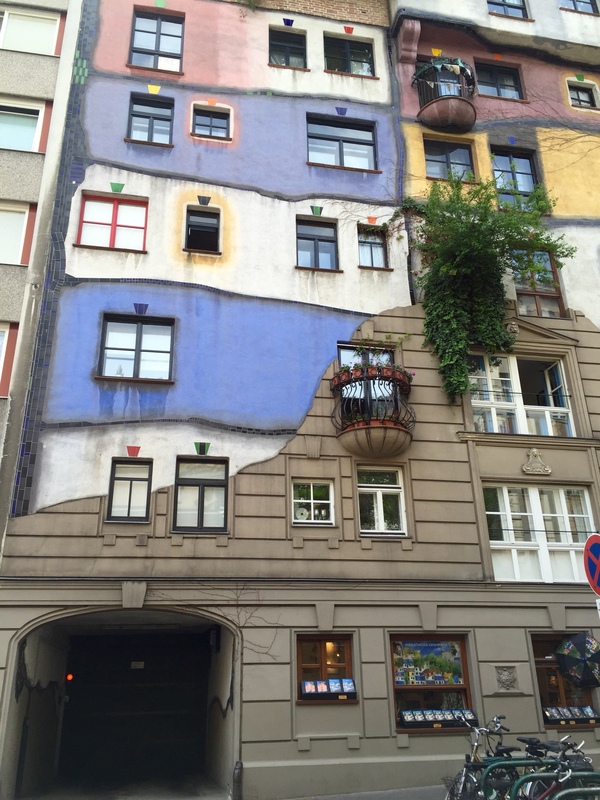 One of Hundertwasser's ideas was that every apartment dweller had a “window right,” that is, the right to paint the façade of the building to the extent he or she could reach it from the window. He also believed that there should be “tenant trees” and that the roof of each building should be green and forested. Remember these columns – I'll have something to say about them later. Dale especially admired his tile work. “I have a bicycle. Paris is big. I want to say that the lines I draw with my bicycle through this great city are extraordinary. The lines are just as wonderful as all the other lines I cross traced by all the other people. I ride around people and obstacles. I am happy at last to be in harmony and in contact with the others. These lines, for which I need many hours and which form an enormous circle by the time I come back and which make me tired, are more beautiful, more genuine and more justified than those I could draw on paper. And I dare say that the lines I trace with my feet on the pavement walking to the museum are more important than the lines I will find there hanging on the walls inside. And it pleases me enormously to see that the line I trace is never straight, never confused, but has a reason to be like this in every tiny part. Beware of the straight line and the drunken line. But above all beware of the T-squared straight line. I would love to meet the occupants of this complex. I don't picture any of them in suits carrying briefcases. 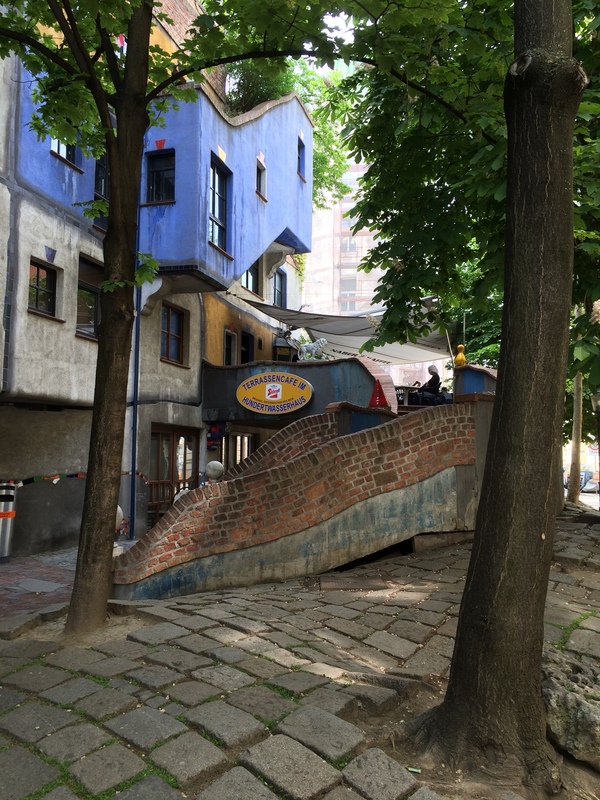 For some reason, looking at Hundertwasser's buildings makes me think of The Hobbit. 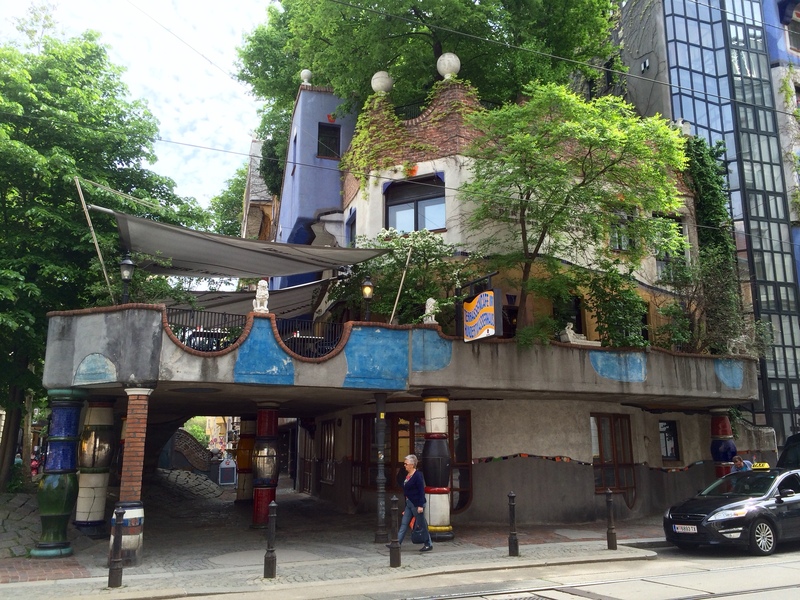 And here where the Hunderwasserhaus adjoins another apartment building, it looks like, just for fun, Hundertwasser morphed the two styles together. 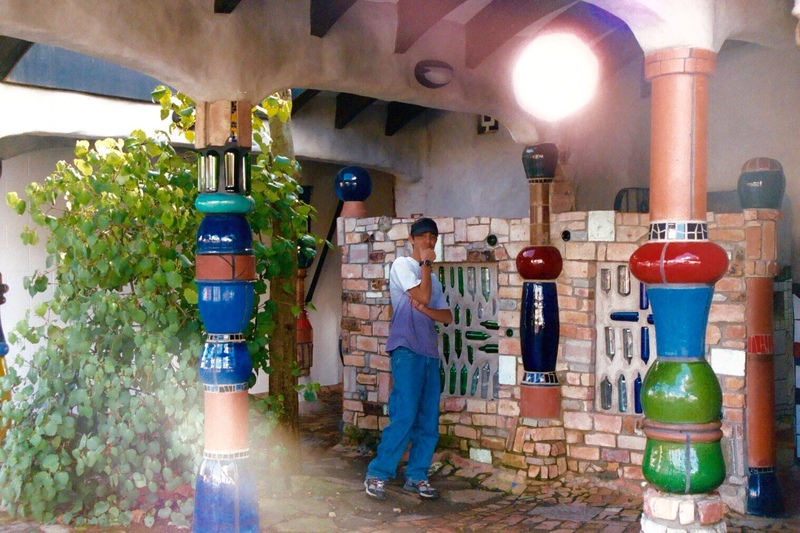 Sure enough, when we looked back through our photos from that trip (thank you, Apple, for iCloud Photos), there it was: the Hundertwasser Public Toilet in Kawakawa, the last structure he designed before he died. And here's a picture of a younger Trevor to prove we were there – recognize the style of the columns? Friedensreich Hundertwasser died in 2000 from a heart attack at sea aboard the Queen Eliabeth II and, as he had directed, his body was taken back to his land near Kawakawa, loosely wrapped in cloth and buried without a coffin just under the surface so that he could become grass and shrub and tree.